Your contribution as an Ambassador of water conservation will change the way others attitude towards water use. KSCST, Indian Institute of Science, Bangalore, India. Water supply for the city of Bangalore in India is always short against the total demand. Surface water is inadequate to meet the demand and the city has to depend on groundwater. Due to rapid urbanization, infiltration of rainwater into the subsoil has decreased drastically and recharging of groundwater has diminished. This scenario requires an alternative source to bridge the gap between demand and supply. Rainwater, which is easily available and is the purest form of water, would be an immediate source to augment the existing water supply by “catching water wherever it falls”. Recycling or reuse of treated water is another source for at least secondary purposes. Karnataka State Council for Science and Technology (KSCST) is actively participating in the socially relevant, environment friendly water conservation measures and has been providing cost effective solutions since its inception 1975. Rainwater Harvesting (RWH) Cell at KSCST is established to study the needs of the people and provide sustainable and simple solutions through innovation and implementation pertinent to Rainwater Harvesting and Ground water recharge. Since November 2005 RWH Cell has provided technical support for planning rainwater harvesting systems in over 300 institutions (Public and private sector, Multinationals and Educational Institutions) in Karnataka and other states of India. Several thousand visitors have personally visited KSCST and availed the benefit and technical knowledge on RWH, water conservation and ground water recharge. RWH cell established at KSCST is providing policy support to the Government departments for water conservation and rainwater harvesting programmes in Karnataka and other states in India. RWH App is developed with the support of UNESCO by KSCST for web and Mobile users. Blog "RainManSpeaks from Bengaluru" is in the web since April 1st 2014 and has published 81 posts. Quiz and Debate programs are organised to build awareness on rainwater harvesting and water conservation measures among students and faculty of schools and colleges. 'Sourabha' Ecofriendly home of Bangalore in India is on a plot area of 2400 Sq.ft. This house is entirely dependent on harvested rainwater for all its need including drinking since 1994. The strategy for sustainable water supply plan for a city like Bangalore should have the combination of conventional river water supply augmented by the 'New Water' supply sources - a. Rainwater harvesting, b. Ground water recharge with sustainable withdrawal and c. Reuse of waste water through treatment. 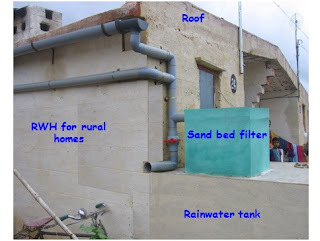 Rainwater harvesting, Sustainable water supply, Water supply strategy to Bangalore, Recharging of groundwater, Sourabha ecofriendly home, Rainwater harvesting cell, RWH app, RWH Advisor. 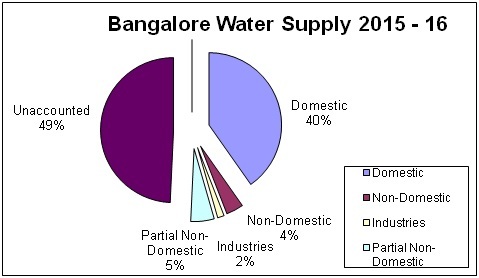 Water supply for the city of Bangalore in India is always short against the total demand. Surface water is inadequate to meet the demand and the city has to depend on groundwater. Due to rapid urbanization, infiltration of rainwater into the subsoil has decreased drastically and recharging of groundwater has diminished. This scenario requires an alternative source to bridge the gap between demand and supply. Rainwater, which is easily available and is the purest form of water, would be an immediate source to augment the existing water supply by “catching water wherever it falls” . Recycling or reuse of treated water is another source for at least secondary purposes. 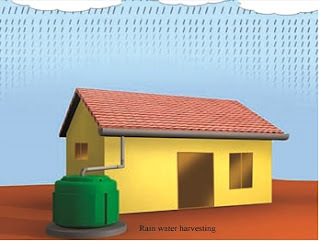 Rainwater Harvesting (Figure 1) has emerged as a viable alternative to traditional perennial sources of water in urban areas facing water shortage and flooding during monsoons. The estimated population of Bangalore Bruhath Bangalore Maha Nagara Palikey's (BBMP's) 198 wards as per the 2011 census is 84.74 lakhs (8.474 million), up from 45.92 lakh in 2001. The population of men and women is 44 lakh and 40 lakh respectively. Since the population is below 1 crore (10 million), Bangalore remains a B class city . The population density in Bangalore has risen 47% in the past decade as job opportunities and economic growth have attracted people to Bangalore. The number of people living per square kilometer in the city has increased to 4,378 in 2011 from 2,985 in 2001. Seven neighboring city municipal councils, a municipal town and 110 villages were merged into Bangalore in 2007. Bangalore is now expanded to 800 sq km in its area. Bangalore Water Supply and Sewerage Board (BWSSB) is planning to cover the BBMP area of 800 sq km. BWSSB has 8, 94,393 (Nov 2016) connections for delivery of water which encompasses domestic, institutional, commercial Government and others. Realized the importance of harvesting rainwater and as a first step through BWSSB, RWH has been made mandatory for most of the properties in Bangalore since Nov 2009. Karnataka State Council for Science and Technology (KSCST) is actively participating in the socially relevant, environment friendly water conservation measures and has been providing cost effective solutions since its inception 1975. Rainwater Harvesting (RWH) Cell at KSCST is established to study the needs of the people and provide sustainable and simple solutions through innovation and implementation pertinent to Rainwater Harvesting and Ground water recharge. Since November 2005 RWH Cell has provided technical support for planning rainwater harvesting systems in over 300 institutions (Public and private sector, Multinationals and Educational Institutions) in Karnataka and other states of India. Several thousand visitors have personally visited KSCST and availed the benefit and technical knowledge on RWH, water conservation and ground water recharge . RWH cell established at KSCST is providing policy support to the Government departments for water conservation and rainwater harvesting programmes in Karnataka and other states in India (Figure 2). The guidelines established by RWH Cell are instrumental in pursuing State Government to amend several acts and issue guidelines for mandatory installation of RWH structures in all the government buildings, public parks, roads and open spaces. Bangalore Water Supply and Sewerage Board (BWSSB) has collaborated with RWH Cell of KSCST and brought in the legislation to compulsorily install RWH system in certain category of properties in Bengaluru. Quiz and Debate programs are organised to build awareness on rainwater harvesting and water conservation measures among students and faculty of schools and colleges. Over sixty five Quiz and Debate programs were conducted in Schools and colleges between October, 2013 and February, 2017 at sixty five Private and Government High Schools and Colleges in Bengaluru. This program has benefited 15,000 students and around 300 school teachers who participated in Quiz. The programmes were organised with the cooperation of over 150 volunteers from Nisarga Mahila Samaja. Several lectures and presentations are being delivered to promote rainwater harvesting by the Council across the state, in addition to news paper articles and television programs. Government of Karnataka realized the importance of harvesting rainwater and as a first step through BWSSB, RWH has been made mandatory for most of the properties in Bangalore effective from November 2009 . 3.1. KSCST with the support of BWSSB has established RWH Helpdesk at KSCST in Indian Institute of Science campus and also at Rainwater Harvesting theme park in Jayanagar Bangalore. This 1.5 acre park on 40th Cross in Jayanagar V Block, demonstrates all techniques of harvesting rainwater. It has 26 working models on rainwater harvesting, ground water recharge and water conservation. The Theme park established by KSCST is the first of its kind in the country, to address frequently asked questions on rainwater harvesting, water collecting systems, filtration and storage systems and groundwater recharge methods. 3.2. The helpdesk primarily aims at training the stake holders such as architects, engineers, contractors, plumbers, masons, etc within Bangalore city through several Training Programmes. Awareness Camps are arranged to bring in awareness among the general public regarding Rainwater Harvesting. Information on technical details of RWH and ground water recharge are being provided at RWH helpdesk for those who visit KSCST or contact through telephone, web and email. 3.3. Skill development programme to train Architects, Engineers and Plumbing contractors for hands on training and rainwater harvesting project planning are being conducted every month. Since inception 74 training programmes are conducted till date and around 1,800 trained personals are offering their services. 3.4. People seeking assistance regarding Rainwater Harvesting (RWH) visit RWH helpdesk at KSCST regularly. Around 20,100 students and teachers from 331 schools and 2,850 students and lecturers from 109 colleges in and around Bengaluru visited Helpdesk at Sir M Visvesvaraiah Rainwater Harvesting Theme Park, Jayanagar. Over 33,000 people have visited RWH helpdesks at KSCST and RWH Themepark till date. They are given practical demonstration with the working models and RWH system at KSCST office by the helpdesk engineers. Feedback from the visitors to the Helpdesk are being collected regularly and analysed for improving the effectiveness of the programme. 3.5. Phone-in queries regarding RWH are being attended appropriately through the helpline numbers: 080 23341652, 080 23348848, 080 23348849 and 080 26653666 at Jayanagar. RWH Theme Park. Around 3000 queries are answered by helpdesk engineers. Various types of questions are convincingly answered. Citizens are also helped to get the contacts of respective plumbers and contractors in their area who execute RWH works. Emails and web enquiries are answered regularly. 3.6. Print and electronic media (News papers, TV, Radio etc.) presented several articles in concern with RWH and RWH Helpdesk activities. 3.7. RWH helpdesk at KSCST has emerged as one stop solution and an effort of the Council to conserve water in the city of Bangalore. Rainwater Harvesting is one of the prioritized projects of KSCST and an important measure to mitigate water scarcity and augment existing water supply. Sourabha (Figure 3) is located in southwestern part of Bangalore (Vijayanagar). Plot area is 2400 Sq.ft. (40ft. X 60ft.). House constructed during 1995. This house is entirely dependent on rainwater for all its need since 1994 (including construction). Rainwater falling inside the plot is being channeled to three applications. Percolation in garden area to recharge ground water. Majority of the rainwater falling on the roof (85%) is channeled to the northern side of the house and is allowed flow in to a tank of 4500 lts. capacity built on the ground floor roof. PopUp filter along with a stabilization tank specially designed will filter the roof water before storing. This water is used during the rainy season. The over flow of this tank is allowed to rundown through rainwater pipe on the wall to an underground sump-1 of 25,000 lt capacity built under the portico at the entrance of the house. In the event of these two tanks getting full, the rainwater is diverted to percolate into the ground through a system of percolation tanks / infiltration gallery (4 recycled plastic drums interconnected and buried underground with their bottom cut open) to recharge ground water. The remaining portion of the roof water (15%) is allowed to rundown through rainwater pipe on the wall and a PopUp filter installed at the ground level filters suspended and floating material. Relatively cleaner water after filtration flows to an underground sump-2 of 10,000 lt Capacity built inside the car park (garage). Sump-1 and sump-2 together with 35,000 lt capacity are interconnected and the stored rainwater water is used during the non rainy days when the roof top tank water is not available. Rainwater falling in the open area or the garden area around the house is allowed to percolate then and there in to the ground to recharge ground water. In this manner not a drop of rainwater falling in the plot is allowed to flow out. Bangalore receives around 1000mm of rainfall in a year. Which translates in to around 2, 23,000 lts per year cumulatively in a plot of 60 ft. X 40 ft. Bangalore has an advantage of having nearly 70 rainy days spread throughout the year. 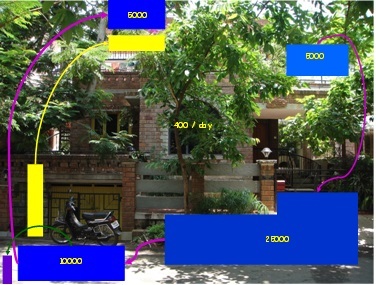 There is no Corporation or BWSSB water connection to this house. Clean and safe water is available 24 hours 365 days a year and the quality of water is also periodically tested and found to be good. ‘Sourabha’ house has inbuilt simple mechanisms to effectively harness all the rainwater falling in the plot and channel the same for different purposes. Even before constructing the house, rainwater harvesting was the answer for the water requirement. The house was constructed by using the harvested rainwater. Since 1995 the entire house needs including potable water is met out of rainwater. As a family of four, water required per month is around 15,000 lts. A family require around 400 lt per day for all the needs except for toilet flushing and part of gardening. The need of toilet flushing is met by recirculation of used water from laundry washing machine. Used water from washing machine is stored in an underground tank and is pumped up to a tank on the roof with vetiver grass. The aerated washing machine discharge water is then used for toilet flushing. Wash water from kitchen sink is diverted for gardening. During days with more than 100 days of continues no rainy days which is very rare in Bangalore, water drawn from a shallow tube well, which gets recharged from rainwater, meets the requirement. Ground water table in and around the plot before the rainwater harvesting was as deep as 200 ft. (Sourabha is located on the top most position of a ridge). Within one year of ground water recharge, water is available at around 40 ft. In Sourabha the amount of water used is far less than the amount of rainwater harvested and ground water recharged. Consequent to this, a social cause to recharge the ever-dwindling ground water is also attempted. There is no recurring cost involved except for the electricity used for pumping up water. The electricity consumption in Sourabha is around 80kWh (units) per month, which includes water pumping also. Low electricity consumption in the house is due to several energy conservation methods and renewable energy techniques adopted in the house. Only 2kg of dry rejects as waste goes out of the house per week. All organic waste converted and used as manure through vermicompost. Water supply to Bangalore need to be provided in tune with both urban population growth and industrial expanse. It is logical to consider new sources of water i.e., recycled / re-processed water as well as harvesting of rainwater which will make both economic and ecological sense. Meteorological data reveals that the rainfall in Bangalore is increasing and this is a recent phenomenon. 100 years of rain fall statistics puts average annual rainfall at 929 mm and 57 rainy days in Bangalore. Bangalore city has the expanse of 800 sq. km. urban spread with Two Million properties (both domestic and non-domestic). The population of Bangalore is 8.5 Million and the water supply at the tap end (excluding losses) is 685 MLD (total supply 1350 MLD – Unaccounted for water 665 MLD) Figure 4 . 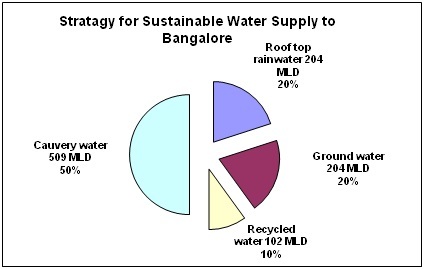 Considering the average roof area available for roof top rainwater harvesting per property at 110 sq.m., the roof top rainwater potential in Bangalore is 81,752 Million Litres (at 80% collection efficiency). The precipitation in the open space of Bangalore can generate water to the tune of 492,370 Million Litres. Considering only 20% of this is recharged to ground water through rainwater harvesting initiatives 98,474 Million Litres will be available for sustainable withdrawal from ground water. Cauvery water supply at the tap end in Bangalore is 250,057 ML (685 MLD) Roof top rainwater Harvesting can provide 2,04,380 ML, Ground water available through RWH will be 1,85,800 ML and the facilities of waste water treatment plants can provide 1,89,800 ML Totaling to 3,07,048 ML or 841 MLD. The “New Water” available at consumer end from the three sources (RWH, Ground water and Waste water treatment plants) will be 509 MLD which is almost equal to the current water supply at the tap end Figure 5. Water Requirement - How to meet? 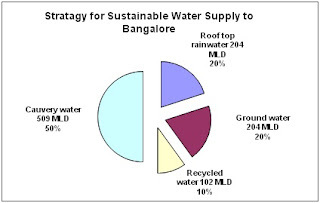 The strategy for sustainable water supply plan for a city like Bangalore should have the combination of conventional river water supply augmented by the 'New Water' supply sources ( a. Rainwater harvesting, b. Ground water recharge with sustainable withdrawal and c. Reuse of waste water through treatment). * A. R. Shivakumar, Principal Scientific Officer, Karnataka State Council for Science and Technology, Indian Institute of Science, Bangalore - 560 012. Do you believe in Sustainability, Conservation, Rainwater Harvesting (RWH)!